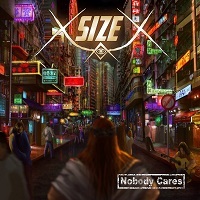 X-SIZE is a Heavy Metal band with some touches from the Progressive and the Power Metal. The band formed in Cartaxo, Portogal, in 2012. Not so much time after that, the band recorded their very first 4 songs and released them under the EP that is named "Some Kind Of Reason". Faster than the speed of light, the band already recorded their debut album that named "Nobody Cares". The album starts with the song that made me to choose to review this band and called "Reborn". It’s a very catchy and great Power Metal song with some crazy riffs and killing chorus. There's some bands that using songs to say how good religion is and how god makes you feel peaceful, so thank god I'm not reviewing one of those now. "Hot Jesus" is a very "religious" song that will make all the religious people to feel very much "happy" to hear. But for my opinion it’s genius critical songs that have the atmosphere of a 70's masterpieces. Again, the chorus is amazing and the lyrics are genius, the song has a potential to be a great Heavy Metal hit. Unlike previous songs, "Never Deny" is much more hurtful and personal song that is hard to hear. This song is a step up for the band, if the previous songs were more fun and happy, in this song the band showing how amazing writers they are. The album titled song is the darkest, the angriest and the most fun song in the album that could be a big hit in live shows. The best song in the album for my opinion is the Rock ballad masterpiece that called "All Of My Life". It’s a genius song that using the elements that been in the album alongside to some Blues and 60's music elements. The song's lyrics are amazing, and I must give all the respect for Alex VanTrue that creating some very personal and hurtful story that been told in a most genius way in this song; I have no doubt, the members of this band are geniuses. They found their own sound and their own attitude to how writing songs. But what the thing that made me love what X-SIZE did is that they truly know how to create emotion, and they are doing it in their own very unique and very special way. I am really speechless and I have no bad things to say about this album.